REUTERS/Yves Herman EU Council President Donald Tusk and Taoiseach Leo Varadkar leave after giving statements about their meeting at the European Council headquarters in Brussels, Belgium February 6, 2019. 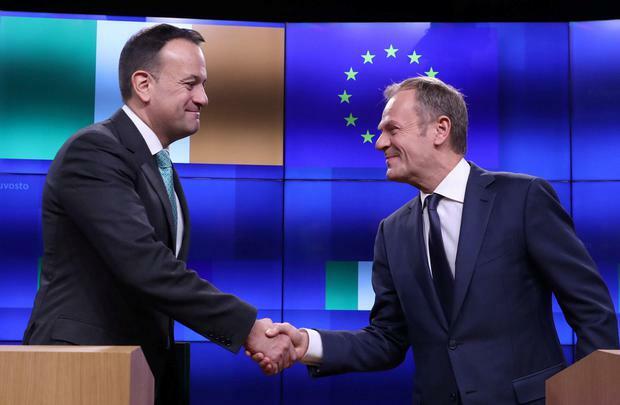 Donald Tusk made the jibe in a press conference alongside Irish Prime Minister Leo Varadkar in Brussels, in which he reiterated the Brexit withdrawal agreement signed off in December was not up for renegotiation. But as Tusk's pointedly blunt language showed, frustration runs deep among European leaders over the British parliament's rejection of the divorce deal and May's demands that the EU now give up on key principles or face disruption in just 50 days. Mr Tusk gave no indication that the other 27 European Union countries will be up for reopening the Brexit withdrawal agreement that British Prime Minister Theresa May negotiated but which was overwhelmingly rejected by United Kingdom lawmakers. "We will not gamble with peace or put a sell-by date on reconciliation", Tusk said. The United Kingdom is on course to leave the European Union on March 29 without a deal unless Prime Minister Theresa May can convince the bloc to reopen the divorce agreement she reached in November and then sell it to sceptical British lawmakers. "We have a government treading water in the Niagara River while the current is taking us over the falls", she told lawmakers in the House of Commons. However, Mr Tusk is unfazed and laughs: "I know". "The EU is first and foremost a peace project".